Our personalized 1.7 oz. 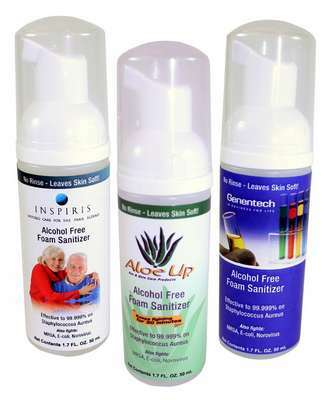 alcohol free foam hand sanitizer moisturizes while it protects. Alcohol free and will not dry out the skin. Price includes 4-color process label. Show your concern and importance for hygiene and wellness with a unique gift this year and let your customers love you more than before! The all new Aloe Up 1.7 oz. Alcohol Free Foam Hand Sanitizer lets you create a custom gift for corporate events and trade shows. This sanitizer is different from others as it uses non-toxic, safe BZK as the killing agent. This long lasting, more effective sanitizer offers three times more protection without any negative effects like those of alcohol based products. This alcohol free sanitizer does not dry out the skin and moisturizes it while cleaning. It does not leave any gel agents that harbor bacteria and is tested to be FDA compliant. The perfect sanitizer for any family, this amazing product can be made official to your business by imprinting custom logo and marketing message for brand promotion.